I’m finding it really hard to tell a complete story in just 1500 words. I use an app for short story writing called scrivener. 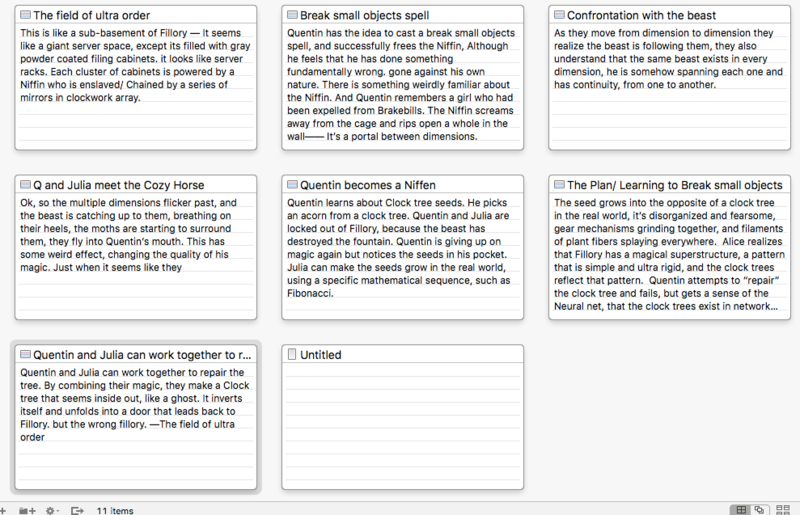 It’s wonderful, and it lets you organize the key components of plot as index cards. I had so many ideas for my story; I wanted to expand the character of Plum and create a new arc for Rupert Chatwin. When I made my plot points I had about 12 index cards. Anyway, I was pretty satisfied with my notes and structure and I started writing. I wrote a cool scene for the first index card which I thought sparked an interesting plot and was true to the characters, and when I checked the word count it was almost 1000 words! I’m still working with these cards but now I think I will be able to maybe develop two of them and I’ll have to figure out how to tell a good story with true characters in a plot structure that only has one change. Are you guys submitting? Let us know if you’d like your work posted in the comments! We’ll share some of our fan fiction later this week! The deadline is February 8th.